*This Part was originally published in August but due to a technical error was not uploaded online. 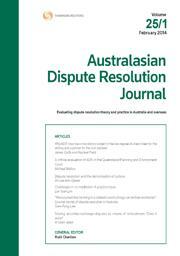 This article examines the reasons why alternative dispute resolution (ADR) is not taught in all Australian law schools, including long-held disagreement between legal academics and law practitioners about the structure of law programs; funding and staffing problems in law schools; and the persistent view of ADR as a “soft” law subject. The article then discusses the implications of not including ADR in the law curriculum and the disadvantages faced by law graduates who have not completed ADR training. The teaching of alternative/appropriate dispute resolution (ADR) in legal education can contribute to law students’ development of professional identity. However, it is important to consider the content of present ADR courses in Australian law schools. ADR teachers should consider including in their curriculum a range of material that challenges law students and addresses the “cutting edge” of the field. Evolving theory in ADR, sometimes known as “second generation practice”, argues that negotiation and mediation can lead to conflict transformation between parties, where there is fundamental change in the ways that parties perceive each other, the conflict and the larger societal issues that pertain to the dispute. Second generation practice differs from first generation paradigms in negotiation and mediation because the focus is largely on relational concerns, although solutions to conflict are often found. Arguably, including both first and second generation practice in ADR courses gives law students the opportunity to engage with differing approaches to conflict engagement which will help them in their roles as lawyers. The concept of the “legal apprentice” has achieved currency again since the publication in 2007 of the Carnegie Report, which set out the three essential apprenticeships of professional education: the cognitive, the practical and the identity apprenticeships. Since 2007, Monash University has offered the elective undergraduate law unit, Non-adversarial Justice. The unit takes a radically different approach to the study of law by focusing on forms of conflict management, dispute prevention and dispute resolution outside the adversarial system. This article briefly outlines the content and approach used in Monash University’s Non-adversarial Justice unit before exploring the three apprenticeships of legal education set out in the Carnegie Report and how the unit responds to these three required areas of legal education. Practice-based courses have grown in Australian law school curricula, along with the idea that law schools must provide the forum for students to learn what lawyers actually do. Teaching and learning in a theoretical framework on its own results in deficiencies in legal education. In 2005, La Trobe University Law School introduced Dispute Resolution as a compulsory first-year stand-alone law subject. In addition to the traditional method of a lecture or seminar-discussion session, a simulation exercise is used to teach the mediation process. This article explores the mediation role-play assessment exercise which is the culmination of skills teaching and learning in the subject. Empirical studies conducted by both Australian and American researchers have established law school’s causative role in increasing law student psychological distress. The purpose of this article is to highlight the role that law school curriculum might play in addressing this problem. By utilising lessons from the field of positive psychology (and in particular hope theory) a first-year law subject at the Queensland University of Technology has been specifically designed to promote law student well-being. Traditional legal education and pedagogy do not hold the answers for addressing this social phenomenon. A first-year curriculum that introduces students to alternative dispute resolution, non-adversarial justice, resilience and the positive role of lawyers in society may go some way to addressing the law student well-being challenge. This article reflects on the inclusion of an alternative dispute resolution (ADR) course as a core component of the Bachelor of Laws (LLB) curriculum for a law degree commenced in 2008. An outline of the course is provided. Student reflections of their experience of the course are reported and linked to three of the threshold learning outcomes (TLOs) for an LLB degree established by the Law Discipline Group to guide legal education. The reflections indicate positive possibilities for achievement of the TLOs and changing the student experience of law schools by the inclusion of ADR as a core course. This article proposes a humanising approach to students’ experience of law school. The impetus for such an approach is research that suggests that law students’ well-being is negatively impacted by the dominant analytical-adversarial paradigm of legal education. The humanising approach proposed is adapted from scholarship and practice in alternative (appropriate) dispute resolution (ADR) and centralises the concept of “relationships” as a humanising feature of an alternative paradigm for legal education. For the pdf version of the table of contents, click here: ADRJ Vol 23 Pt 3 contents.